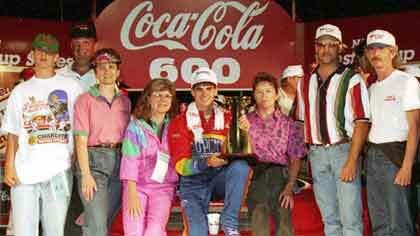 When Jeffrey Michael "Jeff" Gordon started his first NASCAR Sprint Cup (NSCS) race at the age of twenty in 1992, NASCAR Race Mom wonders if he had any idea of the success he would garnish. He started that race in Atlanta from the grid in the twenty-first position and crossed the finish-line in an unimpressive thirty-first. He crashed on lap 164 of the 328 lap competition. However, in May 29, 1994, during the Coca-Cola 600 at Charlotte the Gordon Legend emerged. In one of the more dramatic races of that season, Gordon won the pole, led the first lap and then led 15 more, including the event’s last nine, when he took the lead from Ricky Rudd and held on for the win. When Jeff Gordon starts his engine this Sunday for the Sylvania 300 at New Hampshire Motor Speedway, he will grab another lead from Rudd. Gordon will surpass Ricky Rudd as the NASCAR Sprint Cup Series Consecutive Starts Leader by beginning his 789th straight race. NASCAR’s new Iron Man has not missed a start since making his NSCS debut at Atlanta on Nov. 15, 1992 – a span of 22 years, 10 months and 12 days. What a testament to Gordon’s dedication to the sport and his superior work ethic! NASCAR Hall of Fame nominee Rudd’s streak began on Jan. 11, 1981 and ended on Sept. 20, 2005. Over the stretch, he amassed a 23 wins, 194 top fives, 375 top 10s and 29 Coors Light Pole Awards. While impressive, Rudd’s stats pale in comparison to Gordon who boasts four NASCAR Sprint Cup Series championships, 92 wins, 323 top fives, 467 top 10s and 80 Coors Light Pole Awards! 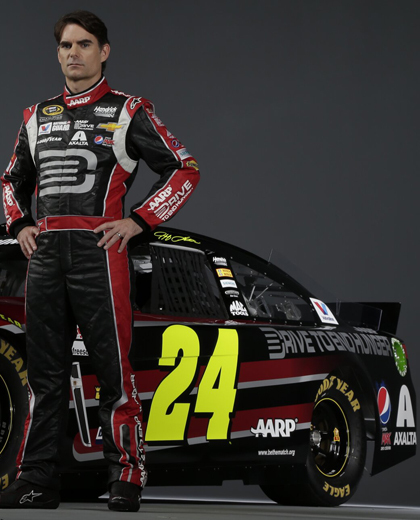 Congratulation Iron Man Jeff Gordon!